The Heroic Admiral and the Box without a Key | Skinner Inc.
What could be more tantalizing to an antiques appraiser than a mysterious locked box? The great-granddaughter of Rear Admiral Frank Wildes, U.S.N. 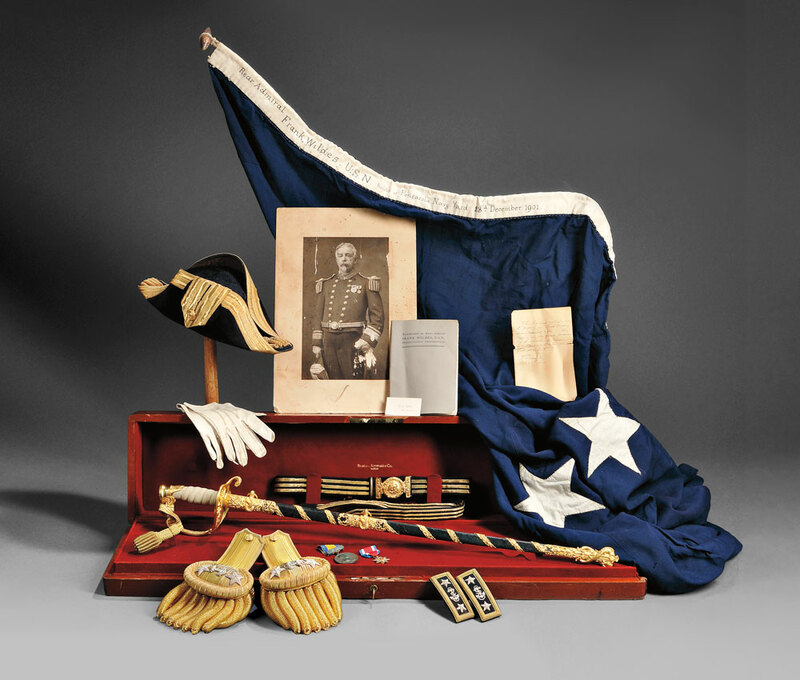 brought such a box to Skinner along with the admiral’s other belongings: a tin case with his chapeau bras, epaulettes, and an image of the admiral, his two-star flag, silver-plate items from his cabin, gloves, a few other related objects. The box looked like a presentation sword case to me, but the great-granddaughter had never looked inside – she didn’t have a key. She left me with the locked case and a binder of family history. Inside, I found an important clue. 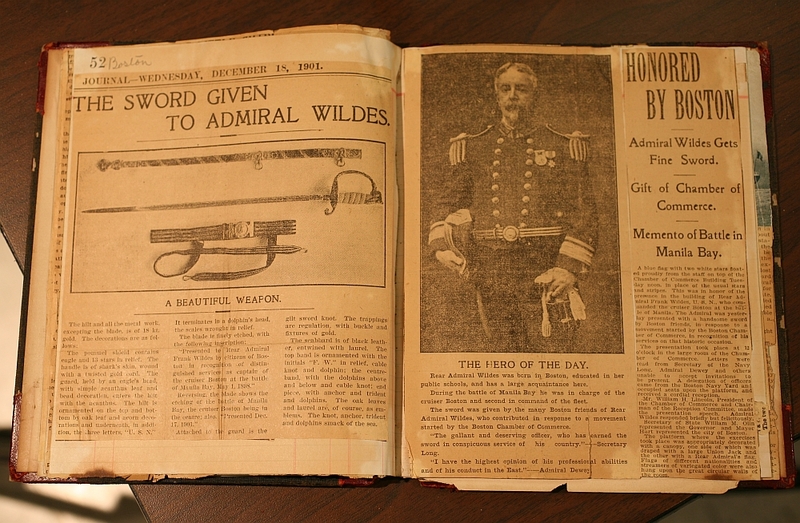 A clipping from the Boston Journal, dated December 18, 1901 mentioned an 18kt gold presentation sword that was given to Admiral Wildes by the Chamber of Commerce and citizens of the City of Boston. After a call to the consignor and a local locksmith, we decided on a date to open the case and see what was actually inside. Two hours of trying to open the case proved fruitless, so we decided to cut the brass tabs that held the case closed. Then, we took a deep breath and I raised the lid to the case. Light hit the inside for the first time in over a century, illuminating the bright glittering gold on the hilt and scabbard. Even the presentation belt was encrusted with solid 18kt gold. The leather scabbard is entwined in gold laurel, ending at a gold drag with dolphins, a trident, and anchor. The shagreen on the grip looked to be untouched, and the crimson cloth liner inside the lid bore the mark of the well-known jeweler Bigelow Kennard & Co.
Model 1852 Presentation Sword by Bigelow Kennard & Co. with the note written by Rear Admiral Frank Wildes, U.S.N. A note inside the box in the admiral’s own hand stated the contents of the box, and included the date January 25th, 1902. We felt a sense of awe and wonder at being the first to see the golden sword in over 100 years. 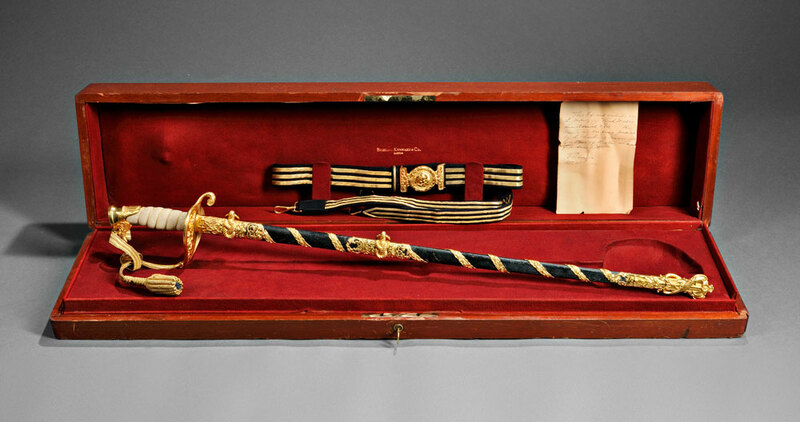 The sword will be offered at the next Historic Arms & Militaria auction on November 2, 2013 along with a collection of Admiral Wildes’ belongings. The estimate on the group is $20,000 to $30,000. Rear Admiral Frank Wildes, U.S.N. Frank Wildes was born in Boston in 1843 and began his military service at the United States Naval Academy in Annapolis, Maryland in 1860. He graduated in 1863, was commissioned, and went directly into service at the height of the American Civil War. His first appointment was to Mobile Bay, Alabama with Admiral Farragut. 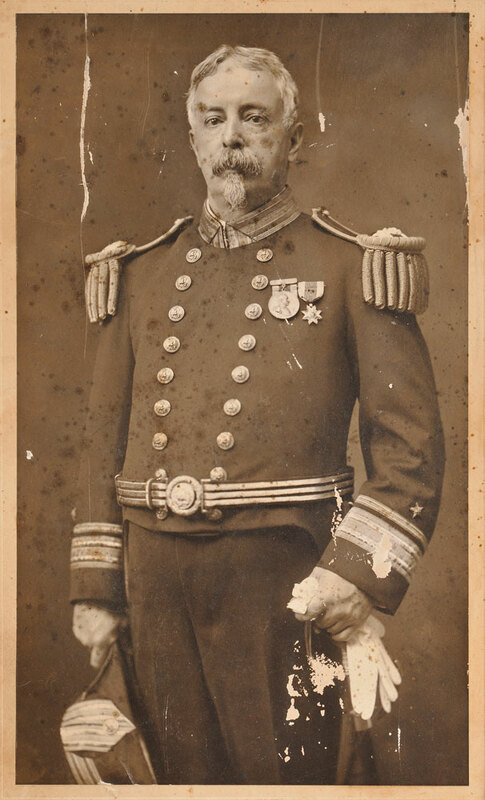 After the war was over, he continued service in the navy, eventually taking command of the cruiser Boston during the Spanish American War. He took part in the capture of Manila Bay, and his ship was hit by enemy fire numerous times. For his gallantry during the battle, the City of Boston decided to make a presentation to Wildes. 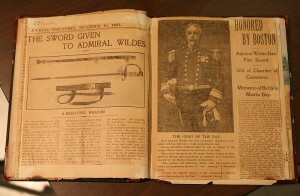 According to a newspaper article, a committee of businessmen discussed that he might be given a home in the city, “as they argued it would prove more permanent and useful.” But after more thought, it was decided that a sword would be more appropriate than a house, and that the form of the sword would depend upon discussion with other naval officers of higher rank than the admiral. At some point, Wildes chose to put the sword away in the box, and closed the spare key inside. I am honored that now, in 2013, we are able to recognize his legacy and present his gold sword to the world. This entry was posted in Blog and tagged Admiral, antique sword, antiques appraiser, Bigelow Kennard, Boston history, Frank Wildes, gold sword, Joel Bohy, Militaria, militaria auction, military antiques, shagreen, war hero by Joel Bohy. Bookmark the permalink. Nice write-up. Thanks. So many items are sold with little or no enthusiasm. Pingback: Clocks, Watches & Scientific Instruments | Historic Militaria | Skinner | Skinner Inc.